The best brand of glow sticks on the market! You will receive 300 stick (1 tube includes 100) luminescent light bracelets in brilliant assorted colors. Your order will also contain 100 connectors so you can hook the ends together to make bracelets and necklaces. Once they start glowing, glow bracelets will last you all night. They will glow super bright for 8 - 10 hours. 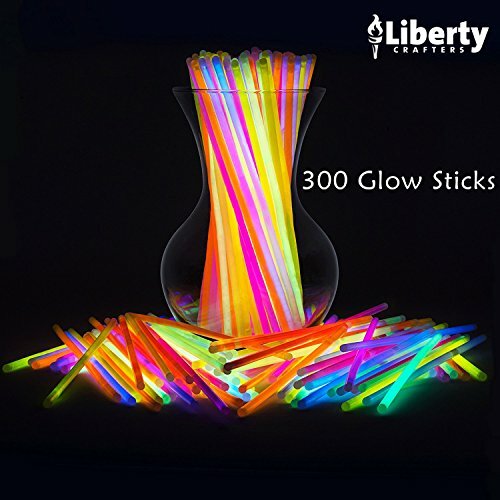 Party Sticks Brand Premium Glow In The Dark Light Sticks - Makes Tons of Glow Necklaces and Glow Bracelets. it starts glowing like magic! FlashingBlinkyLights brand glow products are non-toxic and CPSIA Compliant. They are not radioactive and they are not flammable. PLEASE NOTE: Prior to activation Glow items will not necessarily appear the color that they actually glow when activated. GREAT GIFT For kids birthday parties, party favors, camping trips, Halloween, a glow party, concerts, holidays, special events and more! FUN 8 Inches glow sticks connect to make glow bracelets, glow necklaces and other glow in the dark creations! If you have any questions about this product by Liberty Crafters, contact us by completing and submitting the form below. If you are looking for a specif part number, please include it with your message.